Minne is known in the first place as sculptor. However, his book illustrations belong to the most important usage of graphics in the Belgian fin de siècle. In the period 1889-1900, Minne illustrated six books in total from the symbolist writers Grégoire Le Roy, Maurice Maeterlinck and Emile Verhaeren. In his book design, the artist stood close by to the world of ideas of his Ghent friends from youth, Le Roy and Maeterlinck. Just as Maeterlinck steeped Minne in the early-medieval mysticism of Jan van Ruusbroec, in which concepts such as spirituality, sensuality and simple power are woven together. Mon coeur pleure d'autrefois by Grégoire Le Roy is the first collection of writings that Minne illustrated. The illuminations are conceived as small text vignettes with an initial simple and drawn out delineation, through which the presentation is synthesised to its absolute essence. In each print, the white space commands, against which the image is drawn in hair-fine, fanciful contour lines. The prints are no literal illustration of the textual content, but rather enhance the atmosphere of melancholy and weariness of life that speaks from the poems. The cover subject is connected with the sculpture of the Mourning Mother with two Children from 1888 and with the like-named drawing. For the title page of the theatre piece La Princess Maleine by Maurice Maeterlinck, Minne designed an image that tells a scene from the dramatic piece and at the same time suggests the tragic end of the protagonists. The drawing ultimately did not appear in the work by Maeterlinck, but was printed in the Brussles' newspaper La Jeune Belgique. The heliogravure is iconographically related to the frontspiece that the artist designed for Maeterlinck's poetry collection, Serres Chaudes. 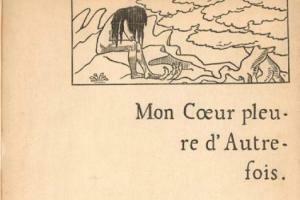 In contrast to the illustration that Minne drew for Mon coeur pleure d'autrefois, he chose here for a decorative and stylised play of line that covers the entire image surface. In the course of the 1890's, the artist evolved towards a style that was heavily influence by the medieval woodcuts and folk prints. In addition, the contemporary British book design of Aubrey Beardsley and Edward Burne-Jones (1833-1898) is an example for Minne. His illustrations take on a more telling drama, whereby a busy, often parallel play of lines commands the image surface. 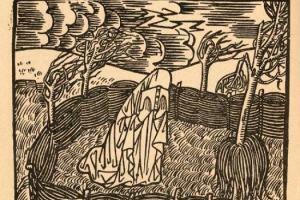 The prints for Trois Petits Drames of Maeterlinck from 1894 are an example of this, as well as the four woodcuts that Minne makes for Les Villages illusoires of Verhaeren. Both with the three one-acts of Maeterlinck as with the poetry collection of Verhaeren, the text and image are again independent of each other, which goes along with the general view of Symbolism. The exceptional prints depict Minne's interpretation of the text, much more than they literally illustrate them. Around 1900 Minne made seven illustrations for the German translation of Maeterlincks Soeur Béatrice. The story is completely based upon the Middle Dutch legend and shows the preference of the symbolists for the Middle Ages. Also, the prints of Minne hearken to a medieval reminiscence; in particular the presentations of the veiled nuns recall the sculptures of Claus Sluter (1350-1406). Such figures, however, are already present in Minne's illustration for Alladine et Palomides, one of the three one-act plays of Maeterlinck, and in his image group The Holy Women at the Tomb. Schwester Beatrix is the last book for which Minne provided the illustrations. Stylistically the prints are associated with the style of Jan Toorop and Charles Doudelet (1861-1938). In the Wiener Secession of 1900, in addition to sculptures and drawings, Minne also presented a woodcut showpiece, The Baptism of Christ. The print dates from 1899 and is the only known print to date of the artist that may be viewed as a stand-alone graphic work. The sheet is part of a collection Germinal with twenty prints from various prominent artists, published by Julius Meier-Graefe. 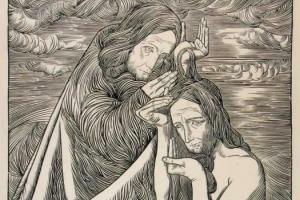 The meandering play of line in The Baptism of Christ is related to the illustrations for Schewester Beatrix.